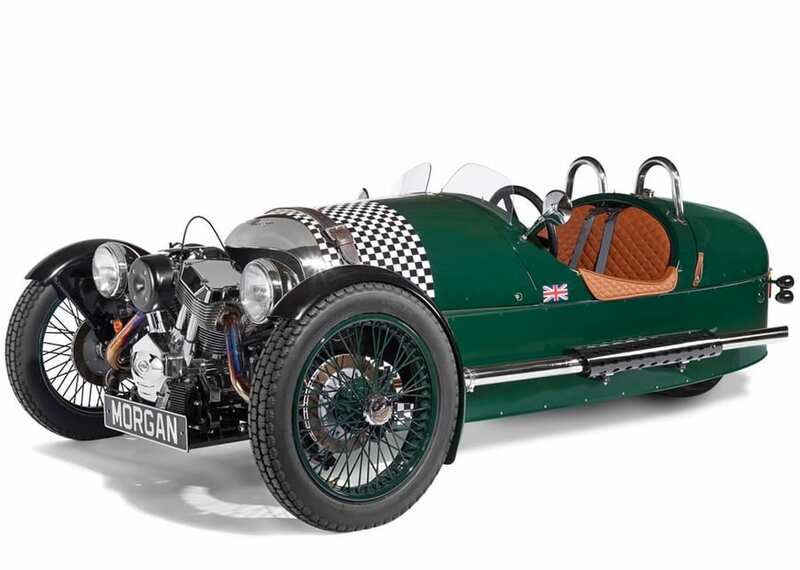 This is the authentic Morgan Three-Wheeler manufactured by Morgan Motor Company in Malvern Link, England, birthplace of the original in 1909. A modern manifestation of motoring’s halcyon days, this rear-wheel drive vehicle seats its driver and passenger within an aerodynamic aluminum “bullet” hull and a padded leather aircraft-style cockpit. Powered by a 2.0 liter, 80-hp S&S V-twin engine that provides 4 1/2-second 0-60 mph acceleration and a top speed of 115 mph, it provides superior track and hill performance with the classic growl of a bygone era without the temperamental performance of cars from the period. Unlike vehicles that mollycoddle drivers with power steering or automatic transmission, this one provides yesteryear’s thrilling experience of applying effort when gripping the leather-clad wheel or engaging the manual brakes. Its 5-speed manual transmission provides reliable downshifting and its rugged front tires grip the road for precise cornering. Meeting U.S. motortricycle classification, its 94″ wheel base results in little to no body roll during turns – rollbars and seat belts provide additional safety measures.